What is it we talking about when we list these characteristics? The answer, of course, is diamonds. Except on this occasion, we are not talking about diamonds. We are referring to tungsten carbide. Most people probably do not realize the similarities between tungsten carbide and diamonds. However, both are widely used in a variety of industrial equipment, not to mention in the more obvious field of jewelry for both men and women. While everyone knows diamond as the hardest substance on Earth, the reality is that, when it comes to metals, tungsten carbide is the leader in that respect. Therefore, tungsten carbide and diamonds are a natural and perfect combination for putting together in a piece of jewelry. Being a man in now is a lot easier than it has arguably been at any time in the past. In bygone eras, men who cared about their appearance would be liable to receive all sorts of jokey comments that on occasion would even venture into downright abuse. As the saying goes, diamonds are a girl’s best friend and all that, so why would a man be seen wearing them? However, precious stones for men are a large part of the modern jewelry market, as are tungsten carbide rings. Of course, men who want precious stones can always opt for gold, silver, or platinum, to name but a few, however none of these metals come with the benefits of tungsten carbide that we listed at the top. Why have stunning diamonds set in a metal that will need shining or maintaining on a regular basis or that is prone to scratch easily, when instead you can buy a product that will be flawless in every aspect? 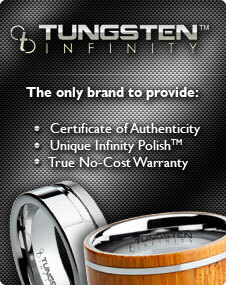 A men’s diamond tungsten ring will say a lot about you, and your sense of style, whatever your reason for wearing it.